Universal Newborn Hearing Screening enables hearing loss, from mild to profound, to be detected within weeks of birth, so that babies with even mild losses are now fitted with hearing aids in their early months. 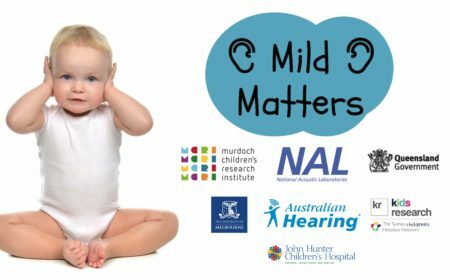 In 2016, around 50% of hearing aid fittings in Australian children less than 2 years old were for those with mild hearing loss. For babies with severe to profound hearing loss, early detection and intervention have clearly led to better outcomes. However, this may not be the case for babies with mild hearing loss, recent research suggesting early treatment may not benefit these children. Alarmingly, the effectiveness of hearing aids for babies with mild hearing loss is unknown. Moreover, the potential burdens must not be overlooked, e.g. parental guilt over non-compliance, potential 'stigma', costs and time. Only a rigorous randomised trial can quantify the benefits versus the costs and harms of early aiding of babies with mild losses. Our trial will determine whether babies with mild hearing loss in both ears should be routinely aided or not.